Mu Ko Ang Thong National Park consists of 42 islands. Its main islands are Phaluai Island, Wua Chio Island, Wua Talap Island, Mae Ko Island, Samsao Island, Phai Luak Island, Kha Island, Hindap Island, Phi Island, Wua Kantang Island, Mae Yat Island, Wua Te Island, Naiphut Island, Changsom Island, Hanuman Island, Thaiphlao Island, Huaklong Island, and Kho Ban Island. The park covers a total area of 102 sq.km of which about only 18 sq.km is land. The National park does not encompass the entire island chain, its jurisdiction covers about 82% of the total area. The park was established on 12th November 1980. Most of the islands consists of limestone mountains about 10-400 meters above sea level. Because the limestone can change its structure easily by both chemical condition and weather, so that makes the islands have many, strange-looking caves and cliffs, and some islands are looked like ancient Angkor Wat in Cambodia and Prasart Hin Pimai. 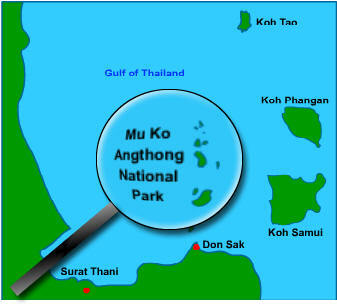 Mu Ko Ang Thong National Park has been influenced by monsoon that causes big waves and heavy rain, approximately 2,000 mm. of rain all the year round, and the temperature is approximately 23 oC. The appropriate time for visiting the islands is between February and April, although the temperature is quite hot but the sea is calm suitable for sailing. Dry Evergreen Forest, occurs on the larger islands with significant patches on Wua Ta Lap,Phaluai and Sam Sao. The principle tree species are; Memecylon sp., Barringtonia fusiformis, Semecarpus curtisii, Cinnamomum sp., Caryota spp., Calamus spp. and Paphio- pedilum niveum "Ang Thong" Pfitz. Beach Forest, occurs in a narrow strip around most of the larger islands, especially in the area above high water mark on beaches. Species occuring include; Terrminalia catappa, Thespesia populnea, Carophyllum inophyllum, Scaevola taccada, Erythrina fusea, Pandanus monotheca and Crinum sp. Limestone forest, occurs on the exposed cliff faces and in the very shallow soils on top of the limestone hills. Most of the plants found here are small and highly adapted to survive in the severe environment, species recorded include; Dracaena loureiri, Euphorbia antiquorum and Morinda sp. Mangrove forest, occurs in the very sheltered spots where sandbars and mudflats have developed. This forest type is best represented around Mae Ko island and on the eastern side of Phaluai island. These forest areas are well structured with many trees, both large and small, the dominant species is Rhizophora apiculata. On the larger islands with areas of undisturbed forest many species of animals are present. Occasionally seen are Spectacled langurs, Hairy-nosed otters, bats, Pacific reef-egret, Brahminy kite, White-bellied seaeagle, Common sandpiper, Edible nest swiflet, Oriental pied hornbill, Southern pied hornbill, Ashy drongo, Collared kingfisher, Monitor lizards, Tortoises, Sea Turtles and Pythons. 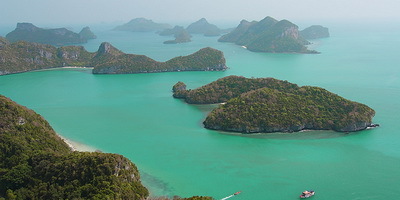 The area of the Gulf of Thailand in which the islands are situated is at a maximum 10 meters deep. The islands rise up out of the water and are thus surrounded by water which is relatively shallow. This means that the water is greatly influenced by turbid river water from the mainland, the river water does not encounter deep water which will reduce its velocity and thus allow carried sediment to settle out. The water around the islands is thus fairly turbid all year round. The coral development on the islands is not extensive and is restricted to a narrow band encircling each island close to the shore, especially on the southwestern and northeastern sides. Although the Northwestern side of the islands is the area most influenced by the monsoon, in sheltered spots good corals develop especially; elephants tusk coral, brain coral, stagshorn coral and in deeper water plate corals of the genus Pavona and flower corals of the genus Goniopora. Animals found inhabiting these reefs include; Butterflyfish, Angelfish, Parrotfish, Stingray, Black tip shark, Grouper and Cowrie shells. In areas where the water is not so clear or is subjected to strong currents the species diversity is poor and is dominated by Seaworms, Crabs and brown seaweeds, of the genus Sargassum and Turbinaria. In places with steep rocky shorelines or where the water is very turbid coral cannot survive. In these areas sedentary marine life is prevalent including; Sea fans, Oysters, Clams and Mussels, which can be seen covering the exposed rock surfaces. The water of the gulf of Thailand is very rich and provides a valuable resource upon which a rich diversity of animals and plants are able to thrive. This richness is long established and thus the seas around Ang Thong are plentiful. Species commercially collected are Softcorals, Penshells, Sponges, Seaweeds and Barnacles, important fish species caught include; Mackerel, Anchovy and Squid. Wua Talap Island situates in Kha Bay. The National Park Headquarters locates here. In front of the office is the white and clean beach appropriate for playing water and recreation. When going to the viewpoint at the top of the mountain, about 500 meters, traveler can see all of Ang Thong islands with strange-looking shape lay in-line on the sea. There is also Bua Bok Cave situated one kilometer from the office. It has beautiful stalagmite and stalactite, and is unique in its geology condition. 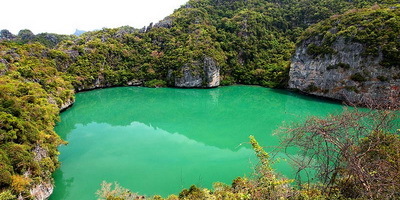 Thale Nai or Lake in the Mountain situates in Mae Ko Island. It is a large natural pond surrounded by complicated limestone mountain. The area has under-water hole connected to the outer sea. There has been assumed that the limestone layer under the lake was sink so that cause the lake, this incident had been occurred simultaneously with the islands, or it might have been occurred by the change of chemical condition so did the caves. Samsao Island situates opposite Mae Ko Island. There have beautiful coral, natural stone bridge curve out into the sea, and white and clean beaches appropriate for camping and swimming to enjoy coral. There are beautiful coral reef and white sand beaches in Thaiphlao Island and Wua Kantang Island. There are trekking trail about 500 meters called ‘View Point Trekking Trail’ located in Kha Bay in Wua Talap Island, and two boating trails called ‘Studying Nature by Boat’. The first boating trail is about 600 meters surrounding Phi Island, and the second is about 2,200 meters between the beach of Kha Bay and the Nathap Beach. More over, there are three snorkeling route call ‘Studying Nature Under Water’; about 200 meters long near Thaiphlao Island, about 150 meters long near Samsao Island, and about 150 meters long in Kha Bay in Wua Talap Island. Booking can be arranged through the parks website or telephone booking at +66 2562 0760. Reservation can be made 60 days in advance. Accommodation - Bungalows are also available. Camping site/Tent - Tent for rent and provides camping area for traveler. Food services - Restaurant is available in the Park. Visitor center - There is a Visitor Center located in Kha Bay, Wua Talap Island, which has exhibition for giving information to traveler. There are several tour operators on Koh Samui where you can book daytrips by tour boat or speed boat as well as kayak and sailing tours. 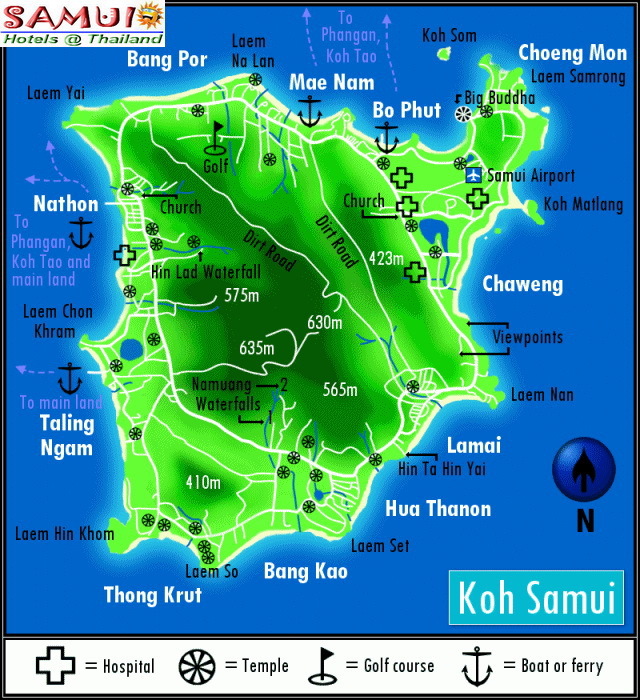 A ferry departs from Ko Samui’s Na Thon pier daily at 8.30 a.m. and arrives at Mu Ko Ang Thong at 10.30 a.m. The fare is 550 baht. On return, the ferry departs from the Ang Thong National Park at 3 p.m. Call 0 7742 2262-3 for details. A one-day tour package to Mu Ko Ang Thong is also organised by travel agents on Ko Samui.